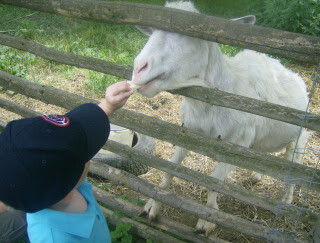 Sunday afternoon we visited the farm of a friend (Sabine). Nathan had so much fun! He fed the goats and horses, took a ride on the horse, chased the ducks and geese, played with the dog, and was terrified of the baby chicks...yes, terrified. I was holding one on my hand and he begged me to return it to the warming cage and after I did, he shut the door... ok, he slammed it shut. I told him the chicks were more scared of him but that didn't seem to make him feel better. 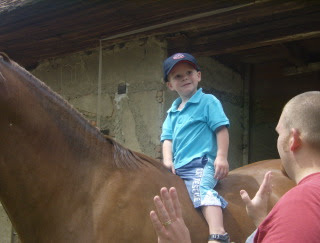 The strange thing was that he loved being on the horse and showed no fear of the large animal. Micah really could've cared less. The dog kept licking his feet. He was entertained mainly by watching Nathan run wild.